When I published my first post here on selling my ZT 260 and buying (gasp!) a diesel-engined Honda Accord Type-S to replace it, Tim asked me to update my impressions after the first year. So how’s it gone? Well, we’re still together, and re-reading my original blog now many of my impressions remain the same. As a car to drive, I continue to enjoy the agility of the Honda’s chassis, the crisp gearchange and the strong mid-range of the engine: it’s an effortless overtaking machine and a quiet and comfortable motorway cruiser. Some road tests of the Accord criticise the profusion of buttons on the dashboard, but in practice you only use a small number of them regularly and the layout soon becomes very familiar. Dislikes? Well, I still miss the sound and the broader power band of a petrol engine (never mind a V8!) and there is little pleasure to be had in revving the Accord’s engine above 3,500 rpm. It took me a while to find the best driving position and the seats are definitely not as comfortable as those in the ZT, with a lumbar support pad which is too high for me and too hard. 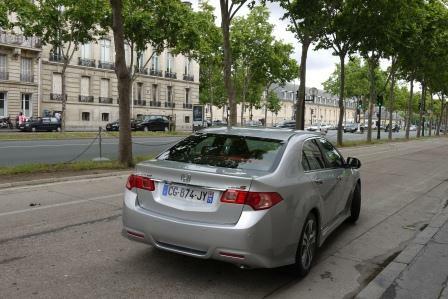 Buying the Accord was as much about making a sensible purchase as the driving experience, and here the Honda has completely lived up to my expectations of it. Over the first 14,000 miles it has been faultlessly reliable and the fuel consumption has steadily improved as the engine has bedded in, with an average of just over 51 mpg so far. I have driven rather more than usual this year and will soon be giving up corporate life to work as an independent consultant, so reducing my fuel bill by nearly two-thirds is all the more welcome. In fact, as a car to own, there’s little I would criticise. The paint seems very soft and suffers from stone chips more than the MG, while the Type-S body kit features a front spoiler that is needlessly low and very easy to scrape, as I found out to my cost when turning into a friend’s driveway in London. In the end the Honda does exactly what it promises to do, and generally does it very well. What is completely missing is that dose of passion which sets the 260 apart from other modern cars and makes it such fun (and sometimes so exasperating!) to run. I often felt that owning the MG was more like maintaining a classic, with the support of specialists like Austin Garages and the Two-Sixties forum helping to make it possible … and great fun! Would I do it again? That’s actually quite hard to answer, and not just from my heart (which still has a V8 beat!). The last year has seen the introduction of more and more new cars with highly efficient petrol engines, such as the turbocharged four-cylinder units from BMW or VW/Audi. The gap in emissions and fuel consumption with their diesel equivalents is narrowing all the time. If I still need to be sensible when the time comes to replace the Accord, opting for petrol may be an option again. In the meantime, I shall keep checking in regularly at the Two-Sixties forum and, who knows, find myself something for fun alongside the Honda! ← Tell your Insurer, its not worth the grief! Good to read from you Julian! I’m glad the Accord is still running well like most Hondas do. Am I wrong or are you considering buying another 260? PS the Accord looks good from that angle. I always rather fancied the restyled S-type.